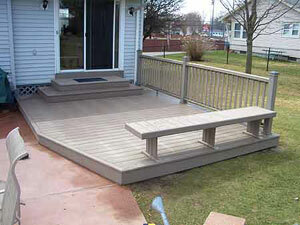 Decks are what we do, and no one does them better. Since 1975, we've built thousands of decks - and in the process, we built a strong reputation for ourselves. Decked Out is #1 on Boston's North Shore. A good deal of our work comes from referrals from happy customers. 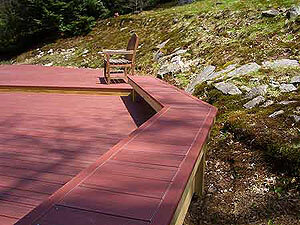 We believe in honoring and protecting our national resources by crafting our decks right the first time. Shabby workmanship wastes precious trees. It stands to reason that because we build only decks, we have it down. We charge less because we're done with less than 1/2 the man hours! 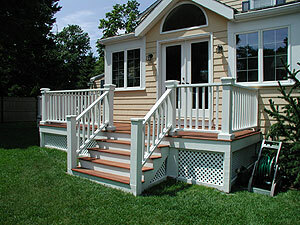 Decked Out decks come in all sizes, shapes and styles to enhance each home's unique architectural style and site. Each deck is carefully thought out and expertly crafted, from our "better-than-basic" economy decks to our one-of-a-kind custom designs that accommodate the natural surroundings. We're always coming up with new ideasto improve your outdoor lifestyle. We take the time to do things right and it shows. What others consider custom extras are standard on all Decked Out decks (except Economy). Lumber. The lumber Decked Out uses is all first quality, hand picked and used to its best advantage; for example, our mitered corners enhance the beauty of the wood. Trimmed edges, smooth notched joints and mitered steps. 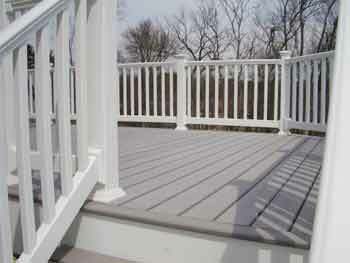 These time-honored finish carpentry techniques take a little longer, but make a big difference in your finished deck. Copper flashing. Flashing is vital to protect your house from water damage. Copper, attached with brass nails, lasts longer and looks nicer than the cheaper aluminum. We proudly stand behind - as well as on and under! - our work. 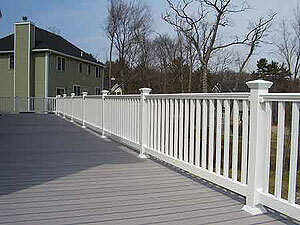 Every Decked Out deck is guaranteed one full year against defective workmanship. In addition, the lumber is guaranteed by the manufacturer against rot or decay. Decked Out customers say it best! Check out our Reference page for comments. Our motto is, "You're only as good as your last three jobs," so please ask us for the names of our three most recent customers. We are confident of our good work and reputation.